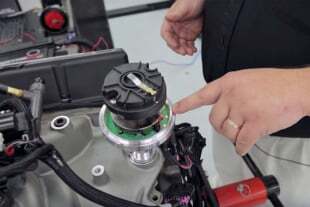 In the grand scheme of things, it wasn’t very long ago when every enthusiast-based car magazine was touting the benefits of the then-new EFI systems geared toward the home DIY-er. Back then, some hot rodders speculated the introduction of this new technology for use on classic cars would bring about the demise of the carburetor. I don’t know about you, but I am still waiting on confirmation of the carburetor’s extinction. One company that is proving the carburetor – especially the Quadrajet – is still viable, is Jet Performance. Each carburetor is inspected and assembled by one technician. Before any work can begin, the unit being rebuilt gets a thorough cleaning and inspection to ensure all parts are usable. When it comes to Chevrolet’s vacuum-operated fuel squirters, there are two distinct camps: Those that praise the Rochester Quadrajet, and those that loath it. Whatever your perception, there is no denying that to Chevrolet enthusiasts, the Q-jet is the least understood carburetor placed on muscle cars and trucks. Left: The accelerator pump discharge passages are enlarged for better fuel volume during acceleration. Middle: JET modifies the idle down-tubes for better idle characteristics and smoother transition into the main fuel-circuit. Right: A common malady in the Quadrajet is a stumble as the secondary air door opens. To alleviate that, JET modifies the secondary pullover circuit. Well into the late ‘80s, a countless number of GM vehicles left the factory with the Q-jet. Those that loathed it, yanked it from the engine and replaced it with something else. Their common – and usually unceremonious – removal, means that they are still plentiful at almost any swap meet. Those that understand and appreciate the carburetor, also feel that it is a very desirable and tunable, four-barrel. Sure, it has more moving parts than any other carburetor, but that just lends validity to its adjustability. We mentioned that JET Performance is still steeped in carburetor performance, and they’ve been restoring, rebuilding, and modifying carburetors for more than four decades. What that means to you is: they have the parts and the experience to resurrect even a recycle-ready Q-jet back to life, making it look and run, better than new. But, JET doesn’t simply rebuild this marvel of fuel distribution. JET can also upgrade the rebuild process to include a multitude of features for various performance enhancements being utilized on a given engine. Depending on your needs, you can choose from a Stage 1, Stage 2, or Stage 3 rebuild. 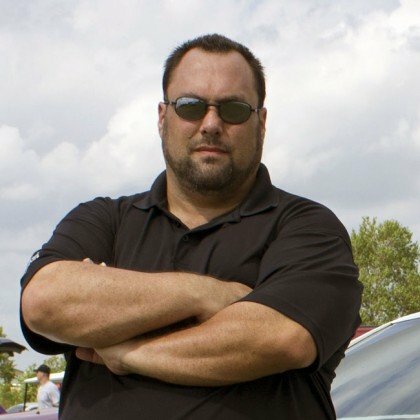 We asked Russell Wood of JET Performance to elaborate. “We have various ‘stages’ of rebuilds. Stages 1, 2, and 3 vary in the applications they are intended to be used. Generally speaking, a Stage 1 rebuild is for stock or very mild performance applications. Stage 2 is intended for a vehicle with an aftermarket intake manifold, headers, ignition, and/or a performance-camshaft upgrade. Stage 3 is designed for serious street and strip, and race applications. We even have circle track applications. All carburetors that are sent to us, are calibrated for the specific application and use,” Russell said. When a carburetor is sent in for a full-blown restoration, all of the parts are re-colored and re-plated to look OE correct. Most carbs are sent in for what is called a standard rebuild, where JET cleans the parts and makes sure they operate properly. For most applications, a standard rebuild is fine, and ensures it works like new. Each JET-prepped carburetor has fuel jets installed to suit an individual application. You tell them how your engine is built and how it will be used, and they’ll build you a calibrated carburetor. When a carburetor that needs rebuilt is for a “numbers-matching” restoration and the owner is concerned about keeping all parts original, according to Russell, that’s not a problem. “If we receive a carburetor from a customer, it doesn’t matter what stage rebuild they need, they get their carburetor back. 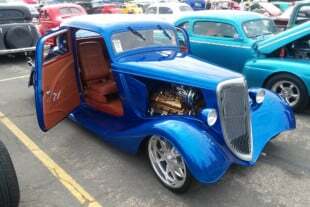 That is very important to someone that is restoring a vehicle and wants to keep a numbers-matching carburetor on their restoration project,” he said. The JET-prepped Quadrajet includes an APT (Adjustable Part Throttle) setting that can be manipulated after the carburetor is on the car. Here, the JET technician sets the base adjustment before final assembly. Before the rebuild can even begin, each carburetor is disassembled, cleaned, and inspected by a single technician. This process is not an assembly line operation, and one technician works on a carburetor from start-to-finish. Rebuilding carburetors this way ensures the core is not only in good condition and can be restored or rebuilt, but also ensures quality control can be monitored. If the technician finds the core has damaged or is missing parts, JET generally has – or can get – the parts that need to be replaced. If it is beyond repair, JET can usually supply the customer with a suitable core that can be rebuilt. A Stage 1 rebuild is for engines that are not modified. It starts with the unit being disassembled, cleaned, and then subjected to a rigorous inspection process. The casting plugs are sealed with epoxy to prevent leak-down into the intake manifold, and all fuel circuits are checked for proper orifice sizing. The calibration is also checked for proper jet sizing and the use of proper primary and secondary-metering rods. The carburetor is then reassembled with high-quality components, including a new float, choke pull-off, and bronze-bushed throttle shafts. If you are looking for factory-stock performance, a Stage 1 rebuild delivers the goods. The secondary vacuum-break is modified and installed to increase the opening of the secondary air door to eliminate bogging under rapid, hard throttle conditions. For those looking to utilize a performance-upgraded Quadrajet, the Stage 2 rebuild might be just what you need. This second-level upgrade includes all of the features found in Stage 1, and also, upgrades like a fully re-calibrated idle, off idle, main, accelerator pump, and high-speed circuits. The mods are designed to be in sync with any modifications or upgrades done to the engine. You simply tell JET what parts you have used to build your engine, and the carburetor you get will be rebuilt and calibrated for it. This is for the enthusiast that is employing entry-level mods like an aftermarket intake manifold, headers, ignition, and/or a non-stock – but mild – camshaft. In a nutshell, the Stage 2 upgrades deliver improved idle quality, instant throttle response, and the maximum delivery of torque and horsepower in mild-performance situations. Once the upgrades are completed, the linkages are then installed. A Stage 3 rebuild is intended for enthusiasts with serious street/strip, and dedicated race cars. A Stage 3 carburetor features an oversize (.135-inch) needle and seat assembly, and an increased main-well size that is balanced to assure sufficient top-end, high-RPM fuel flow. Finally, extensive circuit modifications are performed to keep the fuel curve correct throughout the entire RPM range to obtain instant, off-the-line response for consistent performance. 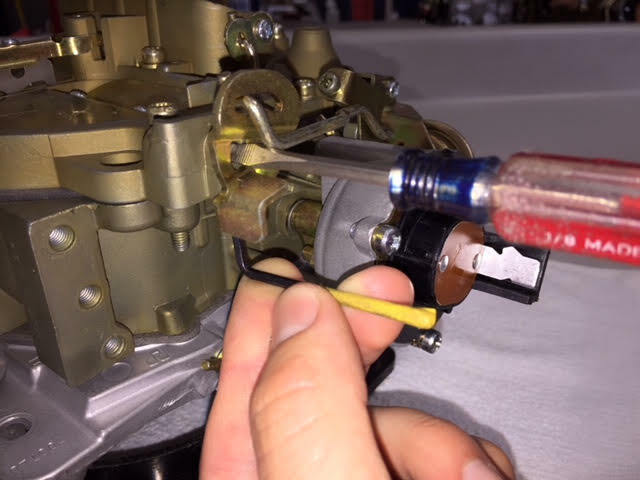 This is how you access the Adjustable Part-Throttle setting after the carburetor is assembled. According to JET, this carburetor is intended for racing purposes only. 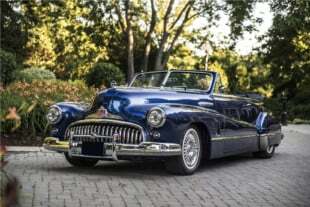 For this reason, the Stage 3 carburetor might exhibit a rich condition at idle and low speeds, due to the calibrations made to operate properly under high-RPM racing conditions. Once the carburetor is assembled, it’s hard to distinguish between an OE and a race-prepped unit – unless you know what to look for. Whether you are looking for a carburetor rebuild for your small- or big-block, race or street engine, JET Performance has established itself as the go-to guys if you want a carburetor rebuild that is tuned to your application. If your engine has been modified, they can calibrate or modify the carburetor to meet your needs, whether it’s for street, strip, racing in circles, or even marine use. Basically, if your Quadrajet is in need of a rebuild or performance modifications, give them a call and see what they can do for you.